In her alternate England of 1851, while taking her friend Sidheag by train to her werewolf pack in Scotland, sixteen-year-old Sophronia uncovers a plot that threatens to dissolve all of London into chaos and must decide where her loyalties lie once and for all. I love the light-hearted, steampunkish, witty world Gail Carriger created for these books. It’s not often you get to read about finishing school debutantes riding dirigibles, fending off flying highwaymen, and taking lessons from a slightly mad vampire. Blue Sargent has found things. For the first time in her life, she has friends she can trust, a group to which she can belong. The Raven Boys have taken her in as one of their own. Their problems have become hers, and her problems have become theirs. The trick with found things though, is how easily they can be lost. The Raven Cycle is one of those rare series where ALL the books are consistently good! This is the third book and it manages to keep that wonderful weird atmosphere going while allowing the main characters to continue to develop and grow. It adds a few new characters which are greet additions (JESSE) without detracting from those I have come to love. Cannot wait for the next book! In modern-day England, where witches live alongside humans, Nathan, son of a White witch and the most powerful Black witch, must escape captivity before his seventeenth birthday and receive the gifts that will determine his future. This book full of witches and magic really is about questioning the boundaries of good and evil and highlights how very little is actually black and white. Is Nathan doomed to be evil because his father is a black witch? Sally Green paces her story very well, dealing out bits of information about who Nathan’s parents were and why he is in a cage. Half Bad sets up a vibrant world and makes it very hard to wait for March when the sequel comes out. Although she’s an orphan in indentured servitude, sixteen-year-old Jennifer Strange is pretty good at her job of managing the unpredictable crew at Kazam Mystical Arts Management. Yet even Jennifer may be thwarted when the mighty Shandar emerges from his preserved state and presents her with an utterly impossible task–how can a teenage non-magician outsmart the greatest sorcerer the world has ever known? But failure has dire consequences, so Jennifer has little choice but to set off on a journey from which she and her traveling companions may never return. Jasper Fforde is excellent at writing funny, off kilter, quirky stories. If anyone has read his Thursday Next series and loved it, you will enjoy The Chronicles of Kazam. Jennifer Strange is an orphan in an alternate England just trying to live her bureaucratic, average life of running a business that hires out wizards. I thoroughly enjoy reading the crazy, humorous stories that come out of Jasper Fforde’s mind. 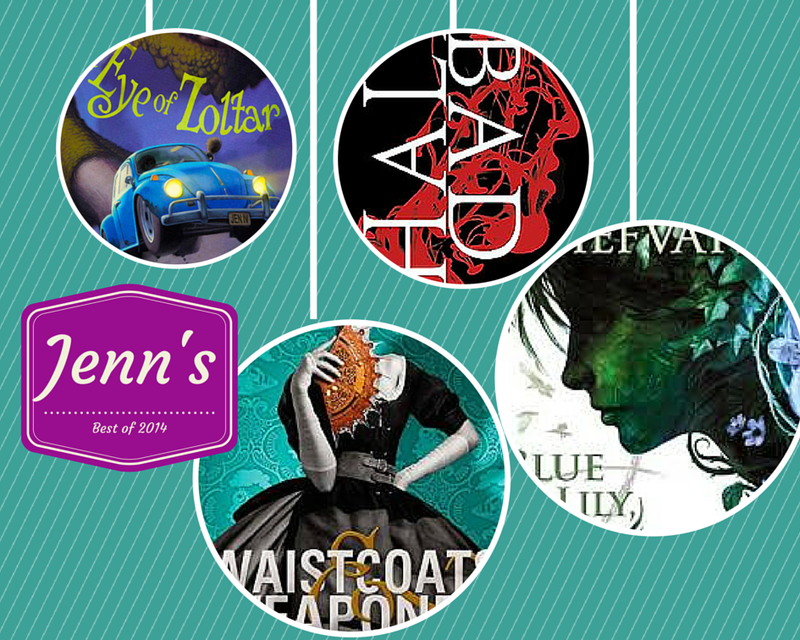 This entry was posted in Best of 2014, historical fiction, paranormal, The Raven Cycle, young adult and tagged Blue Lily, Half Bad, Jenn, Lily Blue, The Eye of Zoltar, Waistcoats & Weaponry. Bookmark the permalink.